Posted May 27, 2018 & filed under #KidsNeedBooks, #KidsNeedMentors, At-Risk Kids. 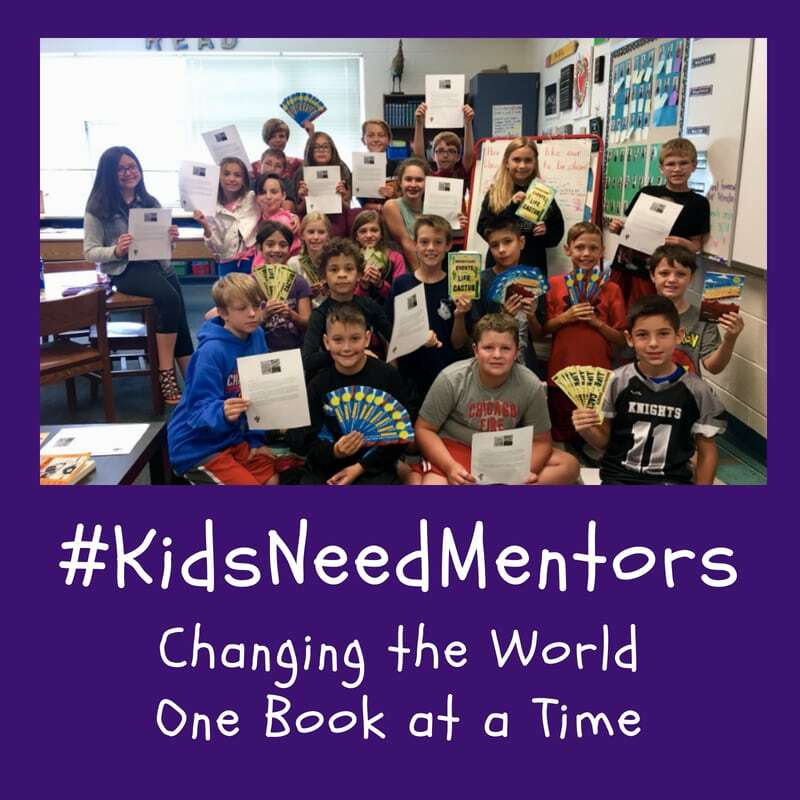 #KidsNeedBooks Is Evolving to #KidsNeedBooks AND #KidsNeedMentors! We’re thrilled that authors & educators are teaming up to help students learn to love reading & writing. Building relationship between authors and classrooms can be so powerful. Imagine a book delivery from an author in the fall, staying in touch throughout the school year (via postcards or e-mail or Flipgrid), and a Skype classroom visit (or maybe even an in-person visit) in the spring. Kristin Crouch, Kristen Picone, Jarrett Lerner, and I are excited to help make this happen. We’ll be piloting a #KidsNeedMentors program this year, and we’d love for you to be part of it! AUTHORS: If you’re interested in being part of this, please fill out the Author Sign-Up Form. We’ll contact you over the summer to let you know who you are partnering with for the year. Thank you for being willing to participate! EDUCATORS: THANK YOU FOR THE AMAZING INTEREST! WE CAPPED OUR PROGRAM AT 300 EDUCATOR SLOTS, BUT YOU CAN SIGN ON TO THE WAITLIST HERE. We’ll be limited in how many connections we can foster, based upon the number of authors that sign up, but we are dedicated to making as many connections as possible. (Please note that Title 1 Schools will get preference.) We will contact you with more information sometime over the summer. Thank you! We know it can take a village to help students develop a love of reading and writing. Here’s to coming together as a village and reaching as many students as we can. I am a K-5 librarian in Orchard Park, NY (the Buffalo area) and our school would love to make a connection with an author this way. My School is South Davis Elementary. Yes, it would be wonderful to match your school up with an author, Christina! Will you fill out the form in the link above in the post? That will help us make the best matches. Thank you! 1st grade teacher in a dual language program. I would love to participate. Wonderful! When you click on the link in the post to fill out the form, make sure to include that info in your responses so we can try to find you the best match. What a fantastic idea! Definitely fill out the form in the link above to apply! I am a Pre-K-4th grade librarian at a school for girls in Memphis, TN. We have a rapidly growing culturally and ethnically diverse population. We would greatly benefit from having a connection with an author. Our school would love to have an author mentor to foster a positive reading climate! I just signed up! So excited to participate with my 3rd graders next year. Hi! I teach kindergarten and first grade in a private school for our gifted kiddos. I know spots are filled but I would love our students to have this opportunity next time! Thank you. I’m a School Library Media Coordinator and would ❤️ to team our K-5 site up with an author. Just signed up! Thanks for the opportunity! I think I signed up as soon as this was launched, but haven’t heard anything since. How can I find out? Also, thanks for doing this! It’s a terrific idea! Yes, you’re in! We’ll be in touch with the author/educator pairings once the school year has finished and we’ve had time to go through the spreadsheets to make the matches. I’m thinking it will probably be sometime in the middle of July. Thanks for checking in! Hi! I signed up when this first went live but how do we know if we made the first 300 or not? Thank you! Hi! If you’re in, you should get an email this weekend with your match. Fingers crossed! Hi! Definitely sign up to be on the waitlist. You’ll have a better chance of getting in next year. It’d be great for you and your students to be part of it! I signed up as an an author. If you are not selected, is there also a wait list for authors for next year (2019)? Thank you so much for signing up! As an author, there’s a chance you might be able to be paired this year, but if not, definitely next year. I would love to get on the list for next school year. I teach 6th grade. Thank you so much! Wonderful! Make sure to fill out the form above. We’d love for you and your students to be able to participate! k-5 librarian in Jamestown, NY. I just read about your program in School Library Journal. How can I be added to a wait list for next school year? Thanks for connecting with us! Just click on the link for Educators above, and fill out the form. We’re keeping track of the wait list for this year and hoping to give all of you folks priority next year. Thank you! I’d love to be paired up again in 2019! I teach 4th and 5th grade ESL students in Southern Maine. Thanks for all of the work that you all have done to get this started this year!! Thank you! !